To fulfill the diversified needs of our prestigious patrons, we are highly engaged in trading and exporting a wide range of Solid Core DO Fuse. 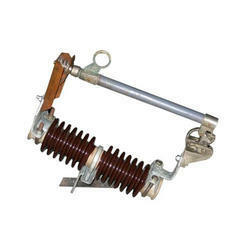 - Mainly used to protect power transmission line and the transformer from power disturbance. Type: Expulsion type Drop out, Outdoor type. As an acclaimed enterprise of the industry, we are involved in manufacturing Drop Out Fuse. Our range of high voltage Drop Out Fuse is manufactured using high grade raw materials and advanced technology machines. This fuse is available in various specifications and can be customized as per the demands of the clients. Easy to install, our drop out lift off fuse provides excellent performance for a longer period of time within minimum maintenance. The dropout (swing out) fuse is an expulsion type and its main function is to protect Transformers on rural distribution network. It is also particularly useful for inaccessible Sub-stations where indication of fusing is of advantage. • The operation of a drop out fuse is extremely violent. • SEW is manufacturing drop out fuses with smooth and trouble free operation. Drop Out expulsion type fuse cut out suitable for installation in 50Hz, llkV/22kV/33kV distribution system for protection of H.T. lines and transformer centers tap lines. Owing to our years of industry experience and precise knowledge of this domain, we are offering an outstanding assortment of 33kv Drop Out Fuse. Skipper manufactured Drop out fuse for Railway traction system complies to specification no. ETI/ PSI/ 14 (1/86). Features: Outdoor expulsion type drop out fuse with channel base.